Check to see if the animal has tags. If the animal has a tag with their owner’s phone number, call the owner to make arrangements for a happy reunion. A dog or cat with a license can quickly be identified by calling the agency that issued the license. 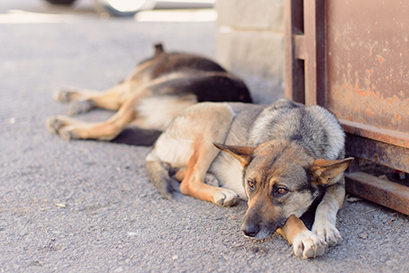 Do not assume a stray dog or cat has been abandoned. There is a good chance that the scruffy, unkempt animal on your doorstep is lost and that a frantic family is desperately searching for him. Veterinarian Clinics, Animal Shelters, and Animal Control Officers can scan the animal for a microchip. Report the lost pet to the Animal Control Agency for the area the animal was found in. You can also take a found stray animal to the shelter. Be advised, anyone keeping an animal for 15 or more days is considered to be the owner, according to the law! You can also notify your neighbors that you have found a pet via sites like Facebook and NextDoor, or post flyers in your neighborhood. If the animal is causing a major traffic hazard, call local law enforcement.